Dr Christopher Wiley returned to Radio Verulam on 6 and 13 January 2013 as a guest on the Arts Programme, speaking in his capacity as a professional musicologist based in the St Albans area. Presenter Alexander S. Bermange interviewed Chris live on a variety of recent developments in the world of music and musical theatre, including the UK release on 11 January of the film version of Les Misérables, whose all-star cast is led by Hugh Jackman. Chris has become a semi-regular guest on the show in recent months, having made five appearances since April last year (see here). 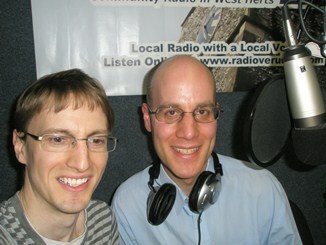 Chris (left) and Alexander (right) are pictured below at the Radio Verulam studio. Chris spoke on Radio Verulam again a few months later, on 5 May, giving a live telephone interview on Ghost: The Musical, which had recently returned to London.